Male: Former Maldives president Mohamed Nasheed vowed sweeping reforms and an end to government corruption after leading his party to a landslide victory just five months since returning from exile. Nasheed, 51, made a dramatic return to the top of the national parliament, with his Maldivian Democratic Party (MDP) securing more than two-thirds in the 87-member assembly. Nasheed promised to use his party’s mandate to usher in a new era of stability and democracy in the Indian Ocean archipelago as it emerges from years of strongman rule, political crises and corruption scandals miring the government and judiciary. 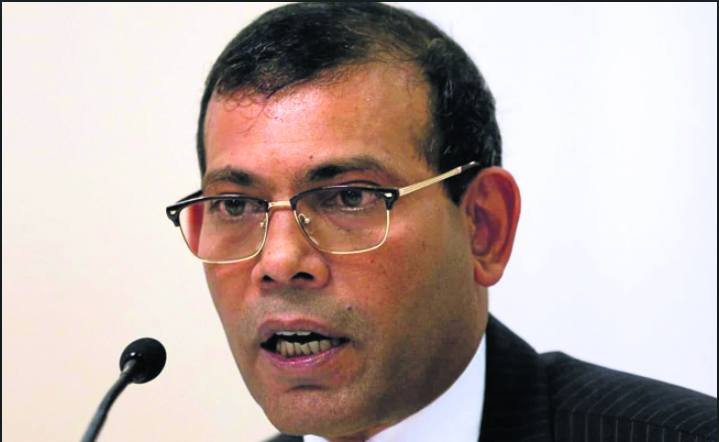 “Our foremost duty is to bring peace to the government,” Nasheed told supporters in the capital on Sunday. Provisional results from the Elections Commission showed Nasheed’s party won 68 seats with the Jamhooree Party a distant second, securing just seven. The party of former president Abudulla Yameen trailed with only four. Nasheed’s comprehensive victory was another rebuke for his arch-rival Yameen, who was dumped in a shock election defeat in September under a cloud of corruption and embezzlement allegations. Yameen did not run, but his party - the Progressive Party of Maldives - finished in third. The remaining seats were collected by minor parties and independents. Nasheed was barred from running in the presidential election but his former deputy, President Ibrahim Mohamed Solih, emerged triumphant over Yameen. The former leader declared the days of “Rolex watches and Kohinoor are over,” referring to high-profile scandals in the Maldives where MPs have allegedly been bought with luxury gifts, including gems. The thumping MDP victory caps a remarkable comeback for Nasheed, who until November was a fugitive in exile. Nasheed was sentenced to 13 years prison in 2015 but left the Maldives a year later, after being granted prison leave for medical treatment in Britain. The charges were dropped by the Supreme Court after Solih toppled Yameen, with judges saying there was no basis for the charges. Rights groups had decried the terrorism conviction, imposed while Yameen was in power, as politically motivated and unjustified.